Learn more about the Imagine I Can Collection in Miss Frugal Mommy's Review! "Ready for this season’s holiday family viewing, Merry Christmas, Splat… and More Winter Stories arrives from the nationally acclaimed, multi-award-winning SCHOLASTIC STORYBOOK TREASURES™ series, which brings best-selling children’s storybooks to life and promotes a love of literature. With faithful adaptations and celebrity narrations, this critically acclaimed DVD series has won hundreds of awards and sold more than 2.5 million videos. 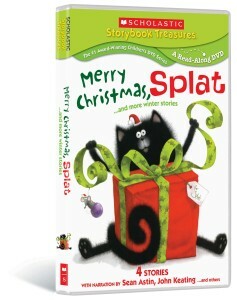 The DVD is packed with endearing, colorfully animated and expertly narrated tales: Merry Christmas, Splat (written and illustrated by Rob Scotton, narrated by John Keating): Splat is trying hard to be good before Santa’s arrival so he can get all the presents he’s dreamed of on Christmas Day! Fletcher and the Snowflake Christmas (written by Julia Rawlinson, illustrated by Tiphanie Beeke, narrated by Katherine Kellgren): It’s Christmas Eve and Fletcher wonders how Santa will find his burrow through all the snow. Snowflake Bentley (written by Jacqueline Briggs Martin, illustrated by Mary Azarian, narrated by Sean Astin): Willie Bentley loved and learned all about snowflakes. Learn more about this fantastic DVD in Miss Frugal Mommy's review! Learn more about this life changing book in Miss Frugal Mommy's review! “Looking for a novel tree ornament or stocking stuffer that’s big on bravos without taking a bite out of the budget? 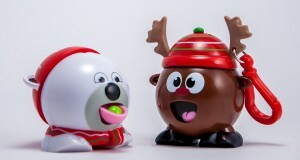 Plan to pick up Jingles the Reindeer and Pep the Polar Bear, the cutest and newest Radz candy dispensers which each come with a code unlocking a virtual experience. Radz plans to celebrate the seasons with the launch of winter-inspired characters to be followed by Valentine’s Day and Easter-themed candy-filled toys.Radz goes a step further for the holidays and sets the price at $4.99 plus gives Jingles and Pep an extra hole in their hat so kids can slip in an ornament hook and hang them on the Christmas tree. At this price, grownups might consider clipping Pep on the outside of a wrapped present or tucking Jingles inside the kids’ lunchbox as they countdown to Santa’s arrival. Better yet, stuff one in every stocking. You can discover more about this great stocking stuffer in Miss Frugal Mommy's review! One fan is going to receive all four products featured in this post! I love those little candy dispensers! I know our kids would love Jingles and Pep. They are just too cute! Thanks for the super giveaway opportunity. Keep up the terrific blogging. I think I'm most excited about the little candy dispensers: they are adorable! I love the idea of the Sparkle Box. I like the sparkle box.